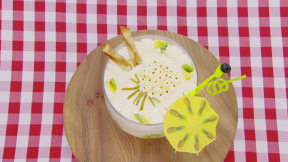 Christine's Caribbean Piña Colada Trifle recipe appears in the Desserts episode of Season 2 of The Great British Baking Show. For the mango jam, place the cubed mango pieces in a pan with the sugar and lemon juice. Gradually bring to the boil to dissolve the sugar. Simmer for about 30 minutes, or until soft and sticky. Remove from the heat and leave to cool. For the decoration, remove long strips of zest from the lime using a vegetable peeler and blanch in a pan of boiling water for a few minutes. Place in cold water to keep the colour. When cool, remove and dry thoroughly. Cut into spiky shaped leaves with scissors for decoration on top of the trifle. Set aside. For the coconut custard, put the coconut cream, milk and vanilla extract into a saucepan and bring to a simmer. Beat the egg yolks, sugar and custard powder in a mixing bowl. When the milk is just simmering, add it to the eggs mixture in a slow, steady stream, whisking continuously. Pour the mixture back into the saucepan and cook over a very low heat, stirring constantly, until it thickens. Remove from the heat and cool the custard. For the sponge fingers, preheat the oven to 200C/180(fan)/Gas 6. Line two baking trays with baking parchment. Beat the egg whites in a bowl until soft peaks form when the whisk is removed from the bowl. Add two tablespoons of the sugar and beat until stiff and glossy. In a separate bowl, beat the egg yolks and remaining sugar until pale and thick. Fold half of the egg whites into the yolk mixture. Fold in the sieved flour and baking powder. Add the remaining whites. Place in a piping bag with a plain nozzle and pipe fingers of about 10cm/4in long onto two lined baking trays. Cook for eight minutes until lightly golden brown, then transfer to a wire rack to cool. For the coconut rum syrup, place the pineapple in a pan with the sugar, pineapple extract and a splash of water. Simmer for about 10-15 minutes. Strain and cool. Add coconut-flavoured rum to taste. For the barquillos (wafer rolls), reduce the oven temperature to 190C/170(fan)/Gas 5. Line two baking trays with baking parchment. Beat the butter, sugar and vanilla in a mixing bowl with an electric beater until smooth. Add the egg white and blend together. Fold in the flour until just incorporated. Drop teaspoonfuls of the mixture onto the baking trays and spread with a teaspoon to form circles of about 8cm/3in in diameter. Bake in the oven until just brown at the edges - about five minutes. Remove from the oven and carefully roll up into thin cigar shapes immediately. Be careful, the biscuits will be very hot. Any biscuits that firm up too much can be returned to the oven for one minute to soften. To assemble the trifle, sandwich the sponge fingers together with the mango jam and cut into 5cm/2in chunks. Place half of the slices of pineapple with half of the kiwi fruit in the middle around the inside edge of a trifle bowl. Place a sponge layer on top and lightly drizzle with the coconut rum syrup. Place another layer of pineapple and kiwi over the sponges, reserving half of the remaining fruit for the next layer. Cover with about 1cm/½in of the cool custard. Repeat the layering once more and add a deeper layer of custard. To finish the decoration, carefully spread a layer of cream over the custard. Whip the remaining cream until thick. Put the whipped cream into a piping bag. Pipe the shape of a pineapple on top of the trifle and use the reserved lime ‘leaves’ for the spiky top of the fruit. Using a cocktail stick, dot tiny drops of light brown food colouring on the point of each rosette of the pineapple. Pipe rosettes of cream around the edge of the bowl. Decorate with a cocktail umbrella, a swizzle stick with a maraschino cherry, a curly straw and 2-3 barquillo wafers. Equipment and preparation: you will need a hand-held electric whisk and a piping bag with a plain nozzle. Plus a cocktail umbrella, curly straw and swizzle stick for decoration.